James Bowie is cast as an absolutely fearless, daring, and dangerous leader of men — his impulsive recklessness matched by his extraordinary ability to repeatedly overcome overwhelming odds to the astonishment of all involved. He was a man of big ideas and fortunes, and men naturally were attracted to his banner, whatever the endeavor, legal or illegal. As far as the fight at the Alamowent, however, he did not participate at all. He was deathly ill with typhoid fever and was shot, stabbed and killed while lying in his sickbed. Davissuggests that he may not have even been lucid when the Mexicans overran the compound (561). He had been sent to San Antonioby Sam Houston to collect whatever he could in the way of useful equipment and arms and then to blow up the compound because Houstonbelieved that it could not be held (493). When Bowiegot there, however, he thought it was strategically valuable as a stronghold for preventing the Mexican army from infiltrating further into Texas. On February 2, 1836, Bowie wrote Henry Smith, provisional governor of Texas, that “the salvation of Texas depends on keeping Bexar [San Antonio] out of the hands of the enemy. … We will rather die in these ditches, than give it up to the enemy. … It would be a waste of men to put our brave little band against thousands. … Again we call loud for relief” (500). Of course, they never got it. What is important, in regards toBowieinTexas, is the role that he played leading up to theAlamo. On several occasions he had been at the forefront of the Texians’ fight for independence and yet he never held a formal military commission. Davis writes that “Ironically, the one Texian who … had seen more action in independent command then any other held no official rank whatever” (492). He is credited with leading them in the first real battle of the revolution atConcepcion, in late October of 1835, where he was outnumbered 4 to 1 and still succeeded in driving the Mexican army under General Cos, from the field (443). He had been recommended to Stephen Austin for several years as a worthy leader and had originally built his reputation on an episode that grew out of a treasure hunt. In 1829, he went on an expedition to San Saba, northwest of San Antonio, looking for reputed silver mines that were based on legends he had been told by locals. There were only 10 men in the company. Before they reached their destination, they were attacked by 124 Tawakoni, Waco, and Caddo Indians. Amazingly, under Bowie’s calm leadership, they were able to fight them off with only one dead and 3 wounded. Yet they killed 40 and wounded 30 of the enemy until the natives gave up and evacuated the next morning (299–304). 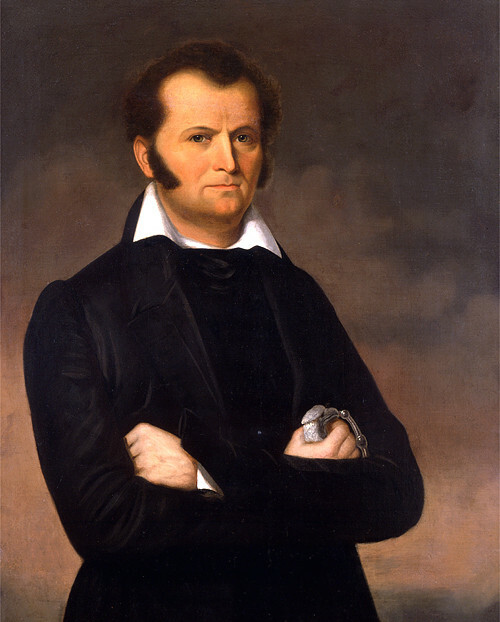 According to Davis, the fight at San Saba “made” James Bowie, it “transformed him in the eyes of tejanos [Mexicans who lived in Texas] and Texians alike into a leader of men, someone to look up to and count on in a moment of peril”(307). In August of 1832, following further outrages by a Mexican garrison inNacogdoches, Stephen Austin tappedBowieto lead a group of men to straighten out a situation with a Colonel Piedras. His 12th Battalion was inciting Indians to massacre Texians and also rigidly enforcing prohibitions against new immigrants (347). BeforeBowiearrived, 300 Texians had formed a militia and nominated James Bullock as leader. However, Bullock was unable to effectively command the men and Piedras ended up evacuating the town and getting away.Bowiewas perturbed and immediately took action, racing after the army with only 20 men. Soon, he caught up with the 200 men in Piedras’ battalion. Through a combination of threat and subterfuge, he was able to convince the Mexican leader that if he did not surrender that all his men would be killed. The Mexicans surrendered and thenBowiedisarmed them and took them back toNacogdoches(348). It was this type of willpower and unprecedented daring that best symbolized Bowie’s leadership qualities and is also why his presence at the Alamo meant something despite his incapacity. Up until he had reached Texas, Bowie mainly had a reputation as a braggart and an exceedingly bold and successful land speculator. Much of Davis’s account deals with his phenomenal success at forging land grants in Louisiana and Arkansas and how that dream of endless land ultimately played an important role in luring him to Texas. Originally, he was born inKentuckyand his family had migrated from there toMissouriand then all the way down theMississippi Riverand finally toOpelousas,Louisiana, where James came of age. He just barely missed the Battle of New Orleans, he and his brother arriving as enlisted soldiers only to find out that the battle had already been won (46). The story of the knife comes about as a result of the fallout that occurred between Bowie and a rival named Norris Wright. Bowie had backed an opponent of Wright for Sheriff in 1826, and there had been a lot of feuding and name calling. Wright lost the election and developed resentment for Wells and all who had backed him, includingBowie. Word reached Bowie that Wells had been defaming his character.Bowieconfronted Wright, Wright pulled a pistol and shot him. The shot didn’t do much harm and they then commenced to fight. As the story goes,Bowiepulled a folding clasp knife from his pocket but couldn’t open it in time as Wright’s friends pulled him off of Wright, leaving one of his teeth in the man’s hand (163). As a result of the fight, Bowie determined to wear a big hunting knife that his brother Rezin then gave him, on his belt for all to see. Rezin had made the knife reputedly from a nine inch iron file that he had hammered down and sharpened a few years prior. He had added the trademark crosspiece to separate the blade from the handle for utility and safety (207–8). And there you have it. Men fought duels over the smallest slight, real or imagined. Their ready resort to such violence may have been in part a cultural artifact from their Scottish and Irish ancestors, encouraged by the inability to accept questions or challenges to authority instilled in Southern men by slavery, and enhanced by a frontier society in which justice and retribution by officialdom could not be counted on to be either swift or appropriate, especially when lawmen themselves … were often parties to feuds. Add competition in land speculation, ambition, and greed, and the mix inevitably led to crowded dueling fields and wayside ambushes (210). In their second encounter,Bowiewas actually shot through the lung mistakenly by Robert Crain, a second of Wright’s company, after Wright and Hall had already called off the duel and agreed to go have a drink. Apparently, he misinterpretedBowie’s intent as he approached the party. But this set it off, and after Crain shotBowie,Bowiepursued in fury. Not only did he get shot with a gun, the pistol itself was thrown at him in an attempt to prevent his pursuit, giving him a head injury, and he was also stabbed multiple times by Wright’s own sword cane. The amazing thing about the story is thatBowie, despite being left alone by his friends, refused to give up and kept on coming. Finally, he reached Wright, pulled his hunting knife, and reportedly said “Now, Major, you die!” before thrusting the blade through his chest, killing the man instantly (214–18). The fight actually made national news and became known as the “Sandbar Brawl.” In time, cutlers on the opposite side of the country began to produce the “Bowie Knife.” Although, in retrospect, it seems to have been a ridiculous circumstance that produced the event, the fighting spirit that James Bowie displayed on that occasion would surface again and again, ultimately leading toBowiebeing dubbed “Colonel” by his company of men several years later inTexas. Though he never held formal titles of military rank, he was frequently the men’s natural choice when it came time to choose a leader.